The First Family departed The Disabled American Veteran National Convention in Florida for their annual eight-day vacation on Martha’s Vineyard, where they are staying at a $7.6 million vacation home with views of the Atlantic. 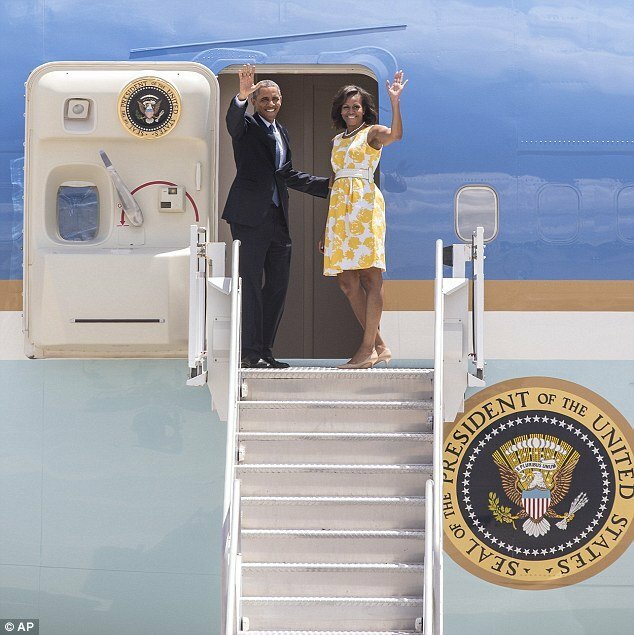 Getting on the plane from Orlando the family sported a smart look with the President Barack Obama donning a suit and Michelle Obama meticulously attired with pearls and a belt around her sun dress. However, when the first couple disembarked in Martha’s Vineyard they were ready for their vacation to start, as Barack Obama had changed into a pair of chinos and Michelle ditched the pearls and belt. The First Family have been vacationing on the Vineyard for years, but this is the first time they will stay at the luxury four-bedroom Chilmark House designed by architect Rick Sundberg. With wall-to-ceiling windows, the 5,000sq ft home has stunning views over the ocean, as well as an infinity pool, tennis courts and a half basketball court. Half the cost of the President’s holiday is met by the taxpayer, and the Obamas pay for the remainder, although they have met the full cost of the vacation home, which is owned by private equity expert David Schulte, according to Bloomberg. David Schulte contributed to both of Barack Obama’s election campaigns and his run for the Senate. It is not known how much the Obamas paid to stay at the house, which was found for them by their broker who specializes in finding vacation homes for prominent politicians and royalty who have specific security needs. He has previously found rentals for the Clintons and also found the Blue Heron Farm where the Obamas previously stayed for years, until it was sold to a British architect for $22.4 million. According to a property expert in the town of Vineyard Haven, Chilmark House would “likely run in the $40,000 to $60,000 range for the eight-day stay”. It is estimated the cost of the entire vacation, including the 75 rooms booked at a nearby hotel for staff and security, could reach $2 million. The Obamas’ vacation home is on the south coast of the Massachusetts elite playground, which is favored for visitors who need extra security. At the entrance of the home, which was built in 1961 and renovated in 2006, is a giant bolder left by a retreating glacier in the Ice Age, according to Sundberg Kennedy Ly-Au Young Architects. A guest house set in its nine and a half acres of gardens could be used by secret service agents, who will accompany the family. With Barack Obama’s approval rating at 46%, according to Gallup, there has been criticism that his decision to vacation in such an elite spot is insensitive, according to the Huffington Post. When he was seeking reelection last year, Barack Obama skipped the family’s usual vacation, but this year he plans to play golf with friends and relax with Michelle and his daughters.